Meade State Fishing Lake - Photo by Jim Mason In addition to a scenic fishing lake and well-developed campground, Meade State Park and Fishing Lake offers much to wildlife watchers. Birders regularly turn up unusual sightings at the area, including the brown pelican and magnificent frigatebird. These apparently lost birds seem to be attracted to the oasis-like habitat of woods and water in an area dominated by flat, open farmland. Nesting Mississippi kites, red-headed woodpeckers, northern orioles, and western kingbirds are at home among park users, who often camp and picnic under tall cottonwoods. The large cattail marshes at the north end and at the spillway area are alive in the evenings with swarms of red-winged blackbirds and barn swallows. During winter the lake attracts flocks of ducks and geese. The cedar trees on the north side of the lake also attract eastern bluebirds, robins, cedar waxwings, and Townsend's solitaires. At the picnic area adjacent to Meade Fish Hatchery a tapped artesian well provides spring water to a narrow stream partly overgrown by watercress. This spring is inhabited by the Arkansas darter-a small fish that lives in the watercress in spring-fed streams in the region and is threatened in Kansas. An interpretive sign identifies the area. Another sign tells the history of the park, dating to its purchase from the Turkey Track Ranch in 1927. Buffalo and elk were kept in what is now the public hunting/wildlife area area to the west of the lake. The tall fencing around this acreage speaks to this legacy. White-tailed deer are frequently seen in the woods around the fish hatchery and along the hiking trail around the west side of the 80 acre lake. These woods are also a favorite roosting site for the local turkey vultures. Primitive camping. 42 campsites with utility hookups. You may reserve a campsite online. A short nature trail is located at the northwest corner of the lake. Click the icon to find a birding list for Meade County. From the intersection of U.S. 160 in Meade (40 miles SW of Dodge City) travel 13.7 miles south on K-23 to the state park entrance. To visit Meade Fish Hatchery, continue west from the entrance, turning right at the next two corners. 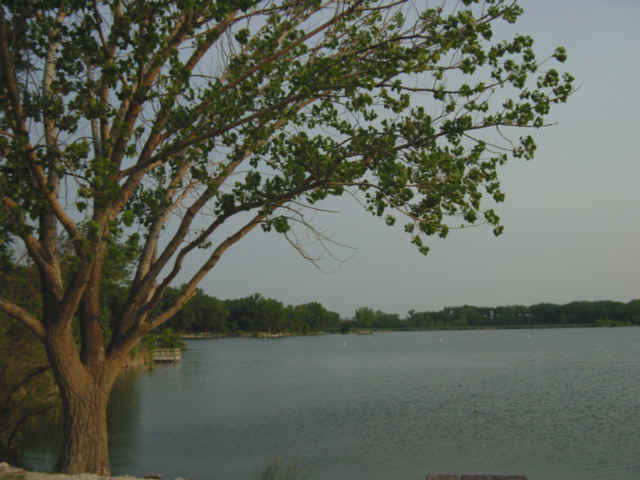 Ownership: The entity responsible for management of Meade State Lake is the Kansas Department of Wildlife, Parks & Tourism. Contact them at (620) 873-2572 if you have specific questions about use or management of the site. Click here to visit the KDWPT web page on Meade State Park. You may download the KDWPT brochure on Meade State Park or email the Park Manager from the links at the top of that page.